My husband and I are pretty active people. It seems like we are always on the go, doing something, so snacks are an integral part of our weekly food repertoire. Now that baby boy seemingly has an endless appetite as well, I snack heartily and often. I could really use a sherpa to carry the large bag filled to the brim with little glass containers of various food items that I haul to work every day. The name of the game is, preparedness. I know well that if I don’t have tasty, healthy, nutrient dense snacks at the ready, I’ll grab something less than satisfactory to quell the gnawing hunger and kicking baby in my tummy. It is with this in mind that I bring you the following post. All of the items are perfect for packing either for an office lunch, a picnic, or in our case, a daily snack. And since most of the items are meat and dairy free, you don’t have to obsess over whether or not you ice pack is keeping everything cold enough. This is literally our new favorite hummus recipe. It’s somehow tastes brighter than a traditional hummus made with chickpeas. I usually chop up several kinds of vegetables on Sunday and pack them up for the week. I used this pita bread recipe but substituted whole wheat flour for half of the flour and added a tablespoon of honey. Makes 2 1/2 cups. Bring 4 cups of water to a boil and add edamame. Cook for 4 minutes. Drain and rinse with cold water. Add edamame and all ingredients through pepper to the bowl of a food processor. Turn the processor on and slowly drizzle in olive oil. Scrape down the sides of the bowl and add either yogurt or water. Process until smooth. Preheat oven to 425 degrees. 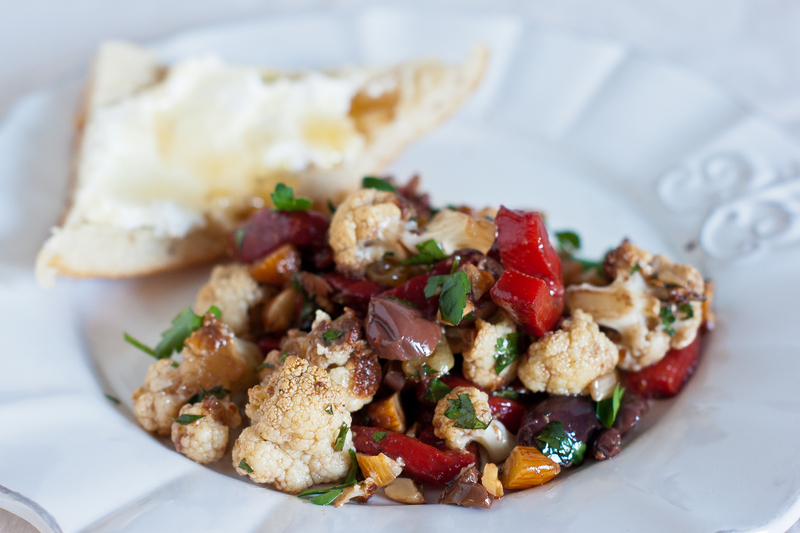 Toss cauliflower with 1 tablespoon of olive oil and 1/4 teaspoon of salt. Spread cauliflower florets on a sheet pan, leaving about 3 inches of room on one of the ends (this is where you will toast the almonds). Roast for 15 minutes. Add chopped almonds to the pan on the reserved space. Roast for 5 minutes. Remove from the oven and add to a medium-sized bowl. In a small bowl, mix 2 tablespoons of olive oil, balsamic, garlic, honey, and remaining salt until blended. Add to the cauliflower almond mixture along with remaining ingredients. Taste for salt and pepper and add as needed. This salad is really versatile and keeps you full for a while. In the summer, I’ll substitute roasted cherry tomatoes, zucchini, and eggplant for the root vegetables. Roasted mushrooms would be brilliant in this as well. Feel free to play with using different herbs or add a bit of feta or cubed, roasted chicken or tofu. Cooking times often vary with farro, so be sure to read package instructions. I start checking after about 30 minutes. I’ve also made this recipe successfully with oat groats. Preheat the oven to 425 degrees. Put farro, 3 cups of water and a pinch of salt in a medium sauce pan with a lid. Bring to a boil, cover, and lower to a simmer. Check for doneness after 30 minutes, then every 10 minutes until it is tender. It usually takes 40-50 minutes. Cool slightly. Toss the vegetables with a 2 tablespoons of olive oil, the whole sprig of rosemary and a couple of generous pinches of salt and pepper. Spread on a sheet pan and roast for 30 minutes, stirring half way thorough the cooking time. Remove from oven, allow to cool slightly and discard rosemary. While the vegetables are roasting, in a small bowl, add the shallot and the teaspoon of salt to the sherry vinegar and allow to sit for 10 minutes. Add olive oil, a few grinds of pepper, and allspice to the vinegar. 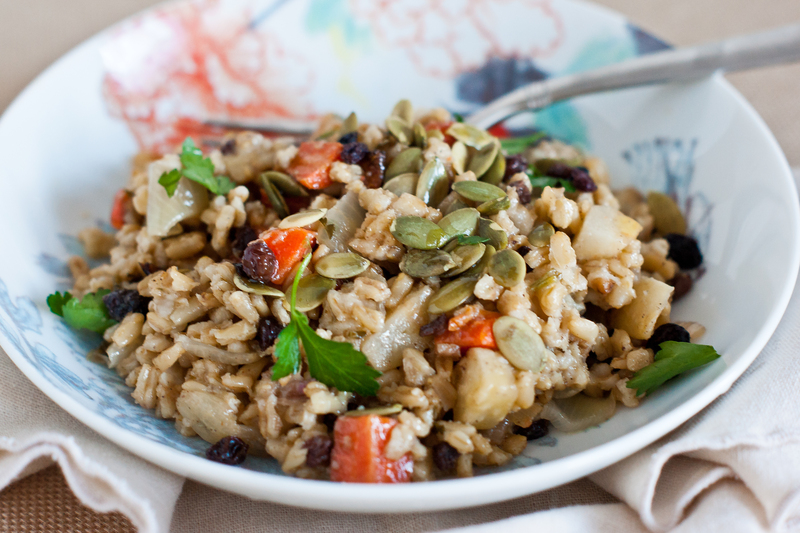 Add the cooked farro, roasted vegetables, and remaining ingredients to a large bowl. Toss with the sherry vinegar mixture and taste for seasoning. Add additional salt and pepper to your liking. Serve cold, at room temperature, or warm.